Attending the Oni School is the best way I know to improve your tenkara skills. 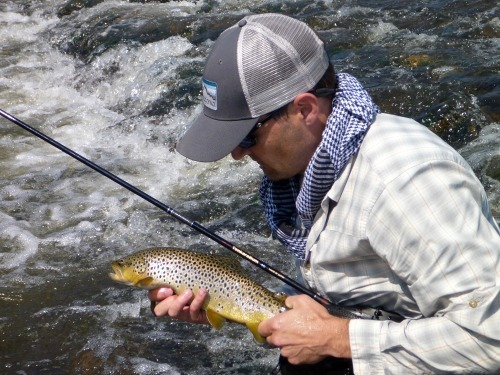 The school is put on each year by John Vetterli, Erik Ostrander and Rob Worthing, the three partners who formed Tenkara Guides, LLC, the first tenkara-only guide service outside of Japan. The Oni School features Masami Sakakibara (Tenkara no Oni), who is renowned for his casting ability. His tenkara style (Oni Tenkara) is much more than just casting, though, and the Oni School teaches all aspects of Oni Tenkara. Oni Tenkara is a complete system. It includes reading the water - not just for where the fish are likely to be but also reading the currents to know where to cast your fly so that the the current will take it to the fish, and where to stand so that you can make the cast that allows your fly to have the desired drift. Water reading, Oni style, includes mentally mapping out the stream features and fishing them in the order that minimizes the chances of spooking fish in spots you haven't yet fished (which may even involve some backtracking). The mental mapping is done before you even enter the water, and is updated and revised as you move upstream. Tenkara no Oni fishing near side of stream first. In one of the demonstrations of how he would approach a section of the stream, Oni fished up one side (staying well back from the stream on a low cobble island) and then cycled back to the beginning of that section. For his second pass, he cast to the slow water and bank eddies on the far side, wading where he and just finished fishing. This allowed him to fish both sides of the stream, staying well away from the water he was fishing. It would also allow any fish caught on the first pass to be landed without disturbing the water where he planned to fish on his second pass. It's a bit like chess, a game in which the masters always think several steps ahead. Don't wade through any water you haven't already fished. Oni's sequence also followed a rule I had learned from a guide many years ago "Don't wade through any water you haven't already fished." At one point, I surprised Oni by catching a fish in ankle deep water that was on the way to the pool I think he had expected me to fish. And of course, Oni Tenkara includes being able to cast your fly so that it achieves the drift you want. In many cases that will include an aerial mend. Not only does your fly land first, the aerial mend aligns the tippet that is in the water with the current, allowing the fly to drift in the direction and at the depth you want. On at least two occasions in his demonstrations, Oni fished the same water several times with the fly a little deeper on each subsequent drift. Tenkara no Oni fishing downsream. Oni School 2015. One thing that strikes me each time I watch Tenkara no Oni fish is the amount of time he spends fishing downstream from where he is standing. This allows him to fish spots that might not be easy to fish from a different vantage point. For spots that can be fished from different angles, it allows him to fish the same water with different presentations, which he does frequently. An upstream presentation is generally dead drift. Across and downstream presentations often include fly manipulation. 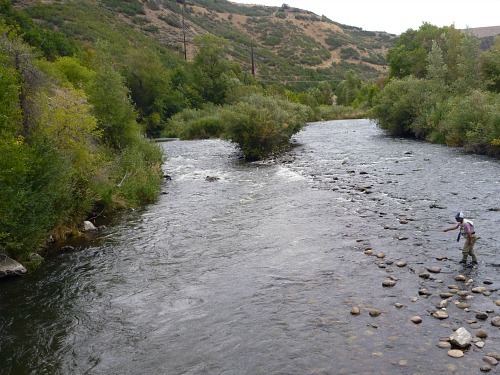 Fishing downstream also allows fishing with the fly right at the surface with absolutely no line or tippet in the water, using the force of the flow to keep the line tight. This achieves two things: he can skate the fly, which mimics a caddis; it is also the least "invasive" way to cover a small stretch of water since only the fly touches the water. That final point was explained by Erik as he was giving a running commentary and explanation of what Oni was doing. Erik, Rob and John have now spent more time with Tenkara no Oni than anyone in the US, and more time actually learning Oni Tenkara than anyone outside of Japan. I found their real-time commentary to be extremely valuable. It is one thing to watch Oni fish and quite another to watch him fish while someone explains what he is doing and why. Many of Oni's movements are so subtle that without someone pointing them out they easily could be missed. Oni gave each participant one-on-one casting instruction (twice if asked). Oni showed me that I was using too much force in my casting stroke. When you stop the rod at the end of your forward cast, the rod tip continues to move forward a bit before springing back. If you use too much force on your forward cast, the rod tip moves too far forward before it springs back. The rod tip doesn't move in a straight line towards your target, though. It moves forward and down, tracing an arc of a circle. The line follows the rod tip, and that downward motion of the rod tip together with the following rebound causes a "U" shaped wave in your line as the line extends. Too much force creates a large "U" that kills your accuracy and often causes your line to hit the water before your fly does. With a softer forward stroke, your line takes a much straighter path. With a softer forward stroke that stops at the right time, your fly always lands first. You do still need to accelerate during the forward cast, and you do still need a fairly abrupt stop, but you really don't need much force. I was also casting with my elbow a bit too far forward. This reduces accuracy. You will occasionally see Oni casting with his elbow a bit extended. After you have racked up 40 years of experience, you can too, but for now, keeping your elbow close to your side will improve your casting. If you need a bit more distance, take a step forward or use a longer rod or a longer line. Extending your arm after your fly hits the water can extend the drift by a second or two. Extending your arm before your fly hits the water ruins your cast. Very small bank eddies can hold fish. Erik taught me (or perhaps reinforced what I had known but had essentially forgotten) two things that definitely can increase your catch rate. One is that fish can be in surprisingly small eddies between rocks almost right on shore - places you might not cast to because, well, they just look too small or are right at the stream bank. (It helps if there is not a streamside trail near the water and even more if there is a big bush right at the bank). If the water is higher than normal, definitely hit all the bank eddies. The second was that you don't always want to keep your line off the surface! When casting upstream into an eddy behind a rock or into a plunge pool, don't be afraid to get your line right into the water so that your fly can get deeper. You will want to lay the line into the eddy also so that it doesn't get caught in the current, which will pull the fly out of the eddy before it reaches the depth you want. Using a white sighter at the end of your colored line reduces the chances that the line will alert the fish. I learned a neat trick from Rob at the Oni School that goes well beyond just keeping your line off the water. It requires practice, but it is definitely worth practicing. 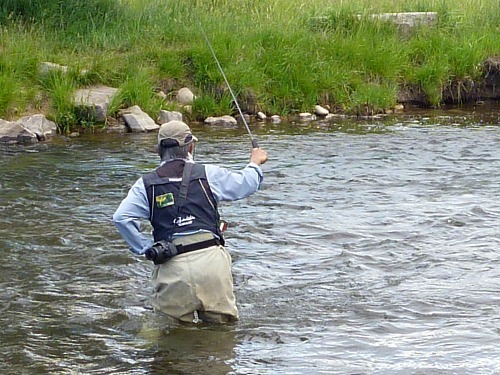 It is a technique used when casting across the stream rather than straight upstream or downstream. Basically, at the end of your forward cast, lift the rod tip a little. If you do that and lift the rod tip straight up it helps your line turn over and helps to land the fly first. That much I already knew, and that can still be done if you are fishing upstream or downstream. What Rob taught me was that if you lift the rod tip a little to the side rather than straight up (kind of like a "V" but with the downstroke vertical and the upstroke a bit to one side or the other) it lays your tippet either upstream or downstream from the fly. That greatly reduces the tendency for the sagging line to pull the fly towards you. If you make the slight lift towards the downstream side it lays the tippet downstream of the fly. That aligns the tippet with the current and reduces sideways drag. If you lay the tippet upstream of the fly by making the slight lift towards the upstream side it allows the fly (or bead head nymph!) to sink further as the line catches up with it in the downstream flow. This is a technique that I suspect Rob will describe in much greater detail as he and Erik further develop their concept of Tactical Nymphing with tenkara rods. Laying a bit of tippet on the water either upstream or downstream of the fly (rather than in a straight line back to you) shortens your effective casting distance, which takes a bit of getting used to. Starting out, make the lift at the end of your cast very subtle. It is easy to overdo it. Unfortunately, I do not have a good photo to illustrate the technique, but if you can imagine your fly in the water and a foot or two of tippet also in the water but aligned with the current, either upstream or downstream of the fly, you will get the picture. This picture of Rob shows that the technique works, though! Aerial mending is something you can see in many of Oni's casts (although it is often quite subtle). Rob, Erik and John have spent a lot of time deconstructing Oni's casting style, and can teach many more techniques than I have outlined above. You do need to have your basic cast pretty well down pat, but then there is a surprising amount of line control and fly control that is possible. "Simple" barely scratches the surface! 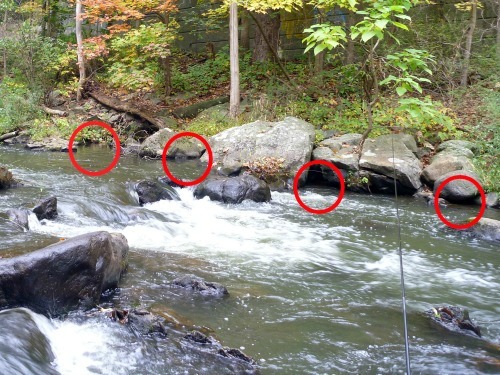 Rob has outlined a number of aerial mends in presentations he has made to the Appalachian Tenkara Jam, the Midwest Tenkara Fest and the Zen Tenkara Winter Series. Those gatherings do not have Tenkara no Oni, and that is really what sets the Oni School apart. They do have presenters who can help you up your game, though. This year's Winter Series, Midwest Tenkara Fest and Oni School are all now over. 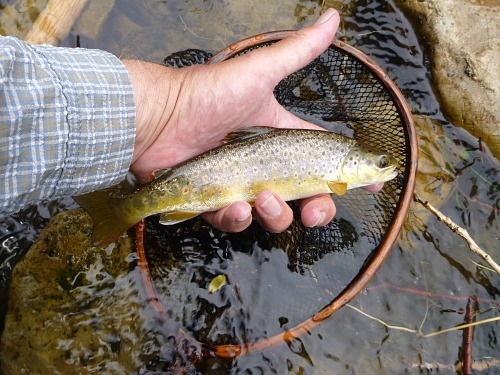 However, it is not too late to register for the Appalachian Tenkara Jam, which this year will feature indoor presentations on Saturday, Sep. 30, followed by a fishing day on Sunday, Oct. 1. Erik will be giving a presentation at the Jam. You won't want to miss it. You also won't want to miss next year's Oni School! It will fill up so don't wait until the last minute. 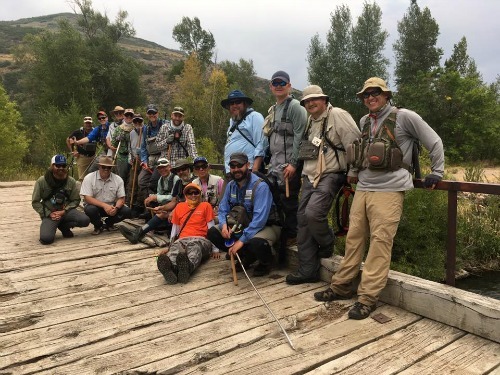 Beyond the presentations and on-stream instruction, any one of these gatherings is a great place to meet fellow tenkara anglers and to try different rods. The camaraderie is at least as good as the fishing. And of course, we all caught some fish. Here's one Chris Hendricks (the only tenkara guide in Norway) caught with the TenkaraBum 40.